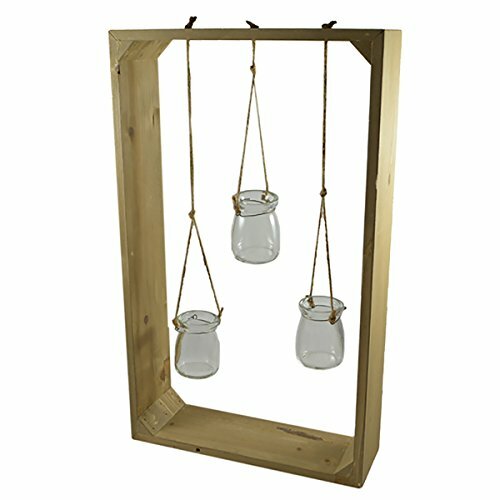 In this sale you will receive 1 of the Frames with Mini Plant Terrarium Jars Hanging in it, in 1 of the designs/sizes you choose above.This is a timeless piece! And it's really an inspiration for any design style as you can adapt and add to it for any design home décor.Display inside or outside for a slight rustic touch. Use for air plants, real plants or succulents. However you cannot use tea lights or candles in these as the rope will catch. Use for air plants, real plants or succulents. If you have any questions about this product by Art Supplies and Home, contact us by completing and submitting the form below. If you are looking for a specif part number, please include it with your message.